Cathy's Voice Now | Sharing my "voice" with others. Sharing my "voice" with others. I am: Follower of Jesus trying to embrace his radical teachings; Mother and Grandmother; Alcoholic/Addict in long-term recovery; Retired NonProfit Manager and Trainer; Writer; Blogger, Want-to-be Actor; Love reading, theater, and music. I worked for the local Crisis Line/Information and Referral Line and Human Services SafetyNet for over 15 years before retiring. I am a now full time college student at Clemson after transferring from College of Charleston. As a child, I learned that keeping secrets was the “norm.” We used the term “don’t ask-don’t tell” long before the military put the policy in place. I knew I had a voice, I just wasn’t allowed to use it. Over the years, I forgot it was there. But in time, I found my voice. I know some people who just don’t know how to stop talking; I don’t know how to stop writing. I can say things through writing that I can’t seem to express by talking. It just feels freer and safer. When people ask me why I share my life and my story so openly, I tell them, “because I have to.” I was in my 30’s before I knew anyone else ever felt the way I did. I didn’t understand that other people had experienced the same pain, the same shame, and the same feelings I had. I am currently working on a book and enjoying writing short stories, poetry, plays, and fiction. Thank you for following my blog, it gave me the opportunity to see yours. Totally understand the writing “because I have to”. I feel the same way. Sometimes I feel I would be even more insane if I didn’t have my blog to vent to. Totally aided my recovery. Thanks Roxy. I love reading other blogs from people who are in recovery and write to heal. Thanks for following my blog. It’s so fantastic when we find our voice, though the journey itself is the point right? Looking forward to reading more. It is all about the journey!! Thanks for sharing so honestly about your long term recovery. Just like you I can’t seem to not write. Looking forward to seeing what you do. Thanks for visiting my blog, liking and following me. I am always searching for blogs that motivate me and inspire me. I want to be a better writer and share my experience, strength, and hope. Thanks for reading. Thank you for following my blog! It’s always nice to know someone else likes what you are doing. I think you have a lot of interesting blog posts, and I totally understand about having to write. It’s just flowing in my blood, pulsating with each heart beat. Looking forward to future posts (and your books!)! Thanks so much. I understand. I got the idea from my therapist many years ago. Writing in different voices, forms, and using pen and paper at times was a great tool to understanding and healing for me. Thanks for reading. Last day of Blogathon and first Day of Camp NaNo. LOL Thanks for stopping by. Thank you for the like on my blog page…I had just put that one up! Hi Cathy, Thanks so much for stopping by my blog today and following 🙂 I am enjoying what I’ve read of your blog. At this moment I’m wrapping up packing for a 10 day trip, so I’ll be off line for a bit, but I’ll be back to read some more soon ! Thanks Brooke. Hope you have a great trip!! Thanks for following my blog. I am always glad to meet a fellow writer. I can understand the “don’t ask don’t tell” philosophy, experienced it growing up. Congratulations on finding your voice. I am always looking for blogs by people who have a passion for writing. Glad to have found your. Thanks for the follow. I wanted to thank you for following my blog and say that you are on a path paved with passion. We all will benefit from your voice! Thanks for popping over and following my blog, Cathy :-). I look forward to reading through yours! Thanks for visiting my blog, Cathy. And thanks for bringing healing to myself and so many others via The Need to be transparent. Gold that is. Everything. My CoDA group always talks about letting the HP take the pen to heal ourselves and others. Here’s to ESH. Always. Ditto on your “about” statement. Thanks so much for reading and “liking” my poetry post. It means a whole lot to me. Thanks for visiting and following my blog. Thanks for giving the chance to follow you. Hi Cathy, thanks for stopping by my blog. It gave me a chance to stop by yours and read your posts. You are a survivor and a thriver! Thanks for dropping by! Take care! I just started reading your blog. Your writing is so honest and authentic. You are a talented writer. I look forward to reading more. Cathy, Like you, I feel compelled to write. It is so healing and has helped me find my voice, as well. As a child of alcoholics, my voice was silenced long ago and the rediscovery is marvelous! What a treat to find someone likeminded -brutally honest about things most people find too painful to face. Thanks for visiting/following my blog …I hope you enjoy mine as much as I’m enjoying yours! Thank you Denise. I am enjoying reading your blog as well and look forward to seeing more posts. Thanks so much Kina…I appreciate it. Thanks so much. What a great award. Thank you for following my blog! I just read your last post and thank you for sharing your story. I was moved by the way you looked at thriving vs choosing to surviving. I posted the ‘Very Inspiring Blogger Award’ at http://wp.me/pUOds-ET and nominated you as one of my top ten choices for inspiring blogs, I’m hoping it gives my friends opportunity to discover other encouraging bloggers. Thanks Trudy. I appreciate it. You have been nominated for the Liebster Award. Should you accept, then click the link below for further instructions. Congratulations! 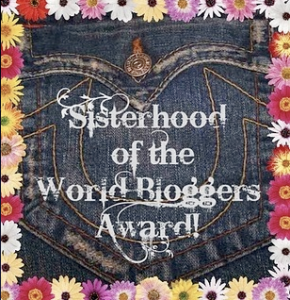 I’m happy to tell you that you’ve been nominated for the “One Lovely Blog” award! If you’ll come by http://stickynotesandquotes.wordpress.com/2012/08/28/one-lovely-blog-award/ you can pick up your award and see the rules. Congrats! Thank you so much for following my blog – I truly appreciate the support:) I’m looking forward to your future posts. I agree with you that writing is sometimes the only way to let go of the baggage in our lives. Even when we don’t feel particularly burdened by something, writing is a relaxing way to pass the time. THanks again and I’ll see you around! Hey, I nominated you for the Very Inspiring Blogger Award. The post with all the details will be up after 2 A.M. Pacific time at http:jmountswritteninblood.com. Congratulations! Hi Cathy, thank you for stopping by my blog today. I am looking forward to hearing more from you and your blog. Have a wonderful Friday! Thanks for the follow and nice to meet you. Good luck writing your book and getting it published. Thank you for following our blog. We sincerely appreciate your support. I agree. Writing somehow gets it out better for me than speaking does. I am intrigued by your story so far. Look forward to following your blog. God bless you! Howdy from Nashville Cathy! Nice meeting you on the blogosphere and thanks for stopping by to check out my slice of the world. Look forward to more of your writing. Cheers! A Big Sunny Arizona HELLO Cathy! Thanks for the response. I lived in Reno, Nv for 6 years….sober…lol I understand the gambling issue all too well. I spent about 8 months living in Mesa, Az just outside of Phoenix. It is quite a bit different from Oregon. Happy to meet you. Good for you Cathy. I’m a “friend of Bill W” too. Hi, Cathy — Thank you for your interest in my blog. I’m happy to have found yours. We share similar childhoods, and I also use my writing to help and heal. I read something recently: “Accept the apology that you never received.” That states so well what I’ve done with my parents. What type of book are you writing? I am writing a memoir but I am not sure what direction I want to go. I have several ideas. My main focus will be to show healing and how people in my life helped me along the way. I am also playing with poetry. I find poetry to be a powerful way to use words. I like the statement about apology. I have done that in my life as well. Thanks for your reply.